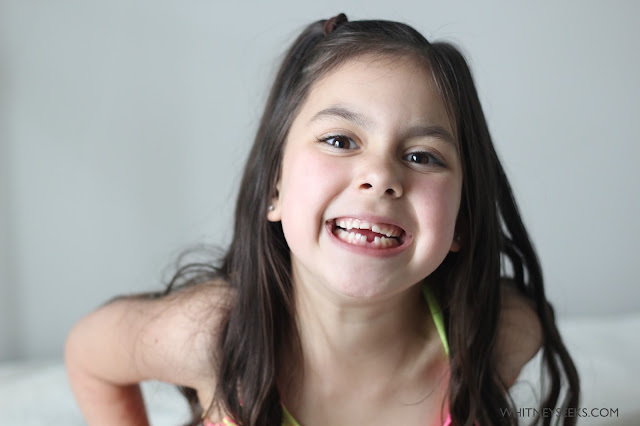 When my five-year-old's tooth started getting the slightest bit wiggly, I was admittedly concerned because I thought five was far too young to lose a tooth and something must be wrong. Once my kids' dentist (regular cleaning, not emergency visit) confirmed that she was right on schedule, and that everything looked great, my thoughts turned to tooth fairy prep. It's not because I'm on top of things, but more because the idea of sneaking into my girls' room after they've finally gone to sleep, only to fish around underneath one of their pillows- again, while they're asleep- to find a tooth and replace it with money before sneaking back out is ridiculous to me. Have you ever tried to get children to sleep? Do you know what happens when you try to sneak out of the room once they finally fall asleep? Your joints creak. Every single one. Every single time. Any parent that values their sanity, and thus, their kids' sleep would be a fool to attempt such an endeavor. Yet, so many do it. I'm not about to risk it. Sure, I could skip over the tooth fairy altogether. We already skip Santa, elves, the Easter Bunny, and leprechauns. Not entertaining the idea that a fairy comes in to replace teeth with money seems reasonable. Before I became a parent, and even a few years ago, I didn't think I would do it. My kids love magic, and fairies, and unicorns. They spend hours lost in their imaginations, and I love it. I encourage it. So why not add to it? As it stands, my oldest is wise beyond her years and has a greater understanding of the way the world works than some adults. She believes fairies, unicorns, and Captain Hook are real, and who am I to deny her that? 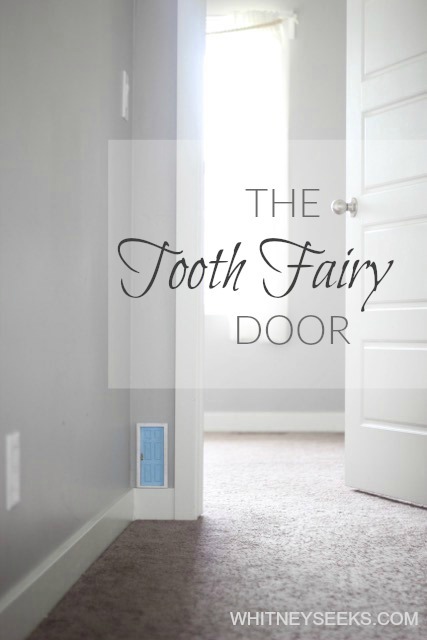 And so, determined to add a little bit of magic as well as avoid moving a pillow beneath a sleeping child's head, the tooth fairy door was created. It seemed the most logical solution. A tiny door placed in the hallway near their rooms for fairies to come and go- specifically, tooth fairies. I found a miniature wooden door and doorknob intended for a dollhouse at a local craft store. It was unpainted, so I had a bit of work to do. I had acrylic paint on hand and went with blue for the door, and white for the frame. Were I to put this on a dollhouse, I would have painted the side of the door that would have been on the exterior of the house. Because I planned to glue it to the wall and I didn't need it to be functional, I painted the opposite side. After the paint was dry, I glued the door closed and added the door knob. I chose a spot in the hallway that wasn't terribly conspicuous, just to the side of a door frame. I intend to use this for all of my kids, so I wanted it to be by both bedrooms. I glued the door to the wall, resting the bottom along the top edge of the baseboard. Was I worried about straight up gluing something to my wall? Well, I have three children. When we move, this will be the least of my repair work. Again, I attached it so that were it functional, the door would swing inward. This way, my kids won't be able to open the tiny door, even if it weren't glued shut. I did this Tuesday night, after they were asleep, which, talk about timing. That slightly wiggly tooth was full on loose when she woke up Monday morning, motivating me to get everything ready a little quicker than my typical craft pace (um, slow). I typed up a letter under the guise of "We heard someone in your household has a loose tooth," as though installing the door and getting introductions out of the way was natural procedure for loose teeth. Introductions? Yes. Our household has been assigned two skilled, certified tooth trade workers, both male, with a combined twenty years experience between them. I was way too entertained with this. 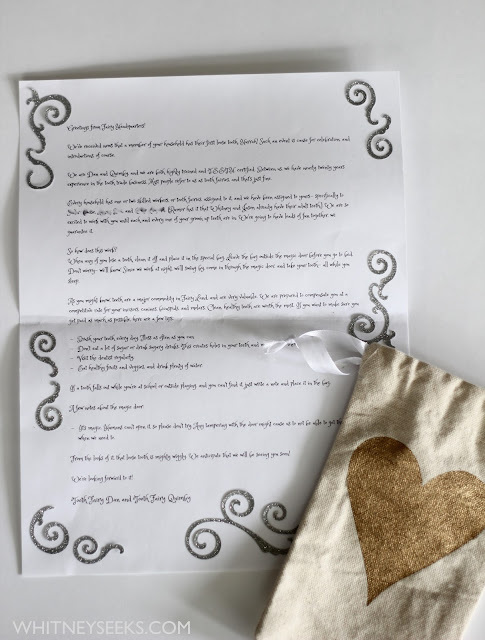 There were instructions to place any lost teeth inside the provided bag and leave it outside the magic door, explaining they would come through the door at night to get the tooth and to leave monetary compensation (cleaner, well cared for teeth fetch a higher rate). I left the note and bag on the kitchen counter, expecting them to see that first and then have to look for the door. As it turns out, the door was spotted first, resulting in yells of, "MOM! DAD" There's an emergency!" She wiggled her tooth all day Wednesday, and Thursday morning she decided it was time to pull it out herself. It was far more dramatic than I'm making it out to be, but for those who are squeamish, I will spare you the details. She left her tooth in the bag outside the tiny door before going to bed, super excited, of course. All I had to do was grab the bag from the hallway, fill it with cash, and return it. No praying my knees won't crack. No digging around underneath the pillow of a child who is barely asleep because she can't wait to see if the tooth fairies came. Quite likely one of my better ideas. Make childhood fun, but make it easy on yourself when you can.